Yellow is probably my favourite colour, and I frequently wear it teamed with black. 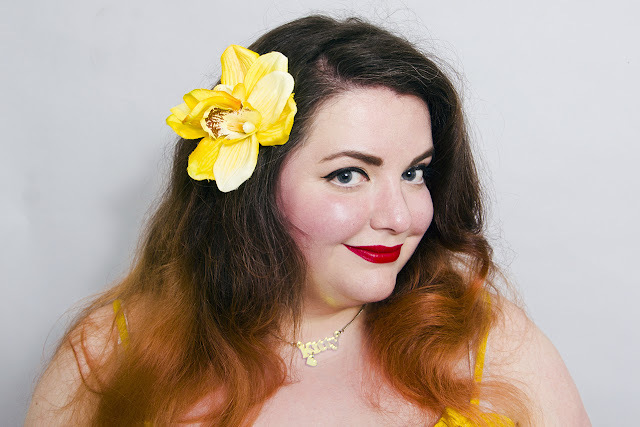 I spend much of my life buzzing around London looking like a chubby bumble bee, and wouldn't have it any other way! Therefore when I came across this dress from H&M+, it was love at first sight and I knew I had to order it for the warmer weather. Turns out it was a good move as I have pretty much lived in it on those rare occasions when summer has raised it's head! Unlike most of the HM+ range, this dress is safe to order in your usual size. If anything, it's a little on the generous size as the bottom half of the dress is very fabric heavy with a tie-waist to gather. Dress: Yellow dress from H&M+ (£29.99). Shoes: Ghillie Lace Up Sandals from F&F (£15). Necklace: Name Necklace from Punky Pins (£8). This is pretty much my go to "sun is shining and I want to feel cute"outfit. Maybe it's the colour, but there's something about it which just makes me feel so happy! That is such a cute dress and you look amazing in yellow! I love yellow too. That pic with the balloons is super cute. I love this dress on you. Thank you so much! ❤ I saw them in a bookshop and thought they were so pretty!